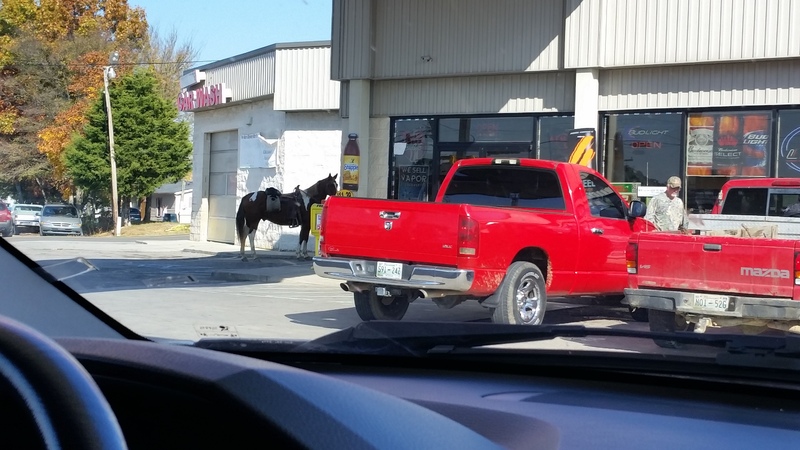 On the way home from church last week, we stopped to get gas, and as we pulled up to the pumps, we noticed a man tethering his horse to the car wash bay right next to a block of red pick-up trucks. What struck me about the situation wasn’t that I was surprised by the horse in an otherwise modern setting; it was that I didn’t bat an eye. 12. In “Red State Flyover Country” there are more rural roads than not. Around here a horse – or tractor – on the road is the very definition of traffic jam. People ride their horses along the roads all the time. I pretty much see someone on a horse on my street at least once a week, if not more. Sometimes they ride them to the gas station, Sonic, or even the auto parts store (the irony!). And instead of being an oddity here in the South, it’s just part of the charm. 11. While it may be cold during football season (and we do love our SEC football), snow isn’t an issue. I was actually born in the Midwest and remember going to a couple local school or college games wrapped up in gloves, a hat, scarf, parka and more, all to watch 60 minutes worth of football while flurries flurried. It gets cold here, and sometimes it snows, but snow during a football game happens almost never. Because it’s so hot and humid at the beginning of football season in August, by the time it ends in November, the cool fall tailgate parties and games are eagerly anticipated. Typical Gameday in the South, while students shoveling snow out of the Minnesota stadium prior to last Saturday’s game! 10. When it does snow however, it’s an event. Even if it’s just 3 snowflakes falling over the course of an hour, the world as we know it grinds to a halt. Schools close, and every child heads outside to build an 8″ tall snowman. Of course, it’s usually so warm that any snow melts almost immediately, causing layers upon layers of soaking wet clothing to be thrown into the dryer so that the kids can go out in 2 hours when there’s enough snow to do it all over again. 9. Respect and courtesy are always in vogue. “Yes ma’am,” “No ma’am,” “Yes sir,” and “No sir” are said by everybody to everybody else. It doesn’t matter what age you are, you say it to whomever, no matter their age. The twenty-something waitress at Olive Garden says it to you, the eighty year old librarian says it to an eight year old child, and the cycle of recognizing the importance of manners is perpetuated. 8. One-upping your family recipe for the important foods in life is an art form. You know, important foods like BBQ, peach cobbler, hummingbird cake, baked beans, cheese grits, Coca-Cola cake, brisket, hash browns casserole, spinach dip, bread & butter pickles, blackberry jam, buttermilk biscuits, sweet potato pie and, well, I could go on. Everyone has an aunt, mamaw or crazy Uncle Eddie with a family recipe that’s undeniably better than your neighbor’s recipe for the same important food. At a potluck, sampling a little bit of someone else’s to “figure it out” is practically a sport. 7. No matter where you live, you can get to a beach in under a day’s drive time. Because we have the Gulf of Mexico and the Atlantic Ocean, it’s only an 8 – 10 drive to a salt water beach max. Even if you live in a landlocked state. Likewise, it’s also drivable from most places to get to the Happiest Place on Earth – Disney – too. I can’t say that everybody says these, but having lived here for most of my life, I absolutely have heard all of these used. I don’t use most of them myself, but I have been known to on occasion. I mean, I reckon sounding like a Southerner isn’t too gosh darn awful. 5. We’re proud of our past, but we’re also very forward-thinking. The population in the South has a reputation for being full of the kind of backwoods, redneck, hillbilly country bumpkin that doesn’t know whether to scratch a watch or wind his behind. And yes, we do have some of those kind of folks. But the general population in the United States has their fair share too, no doubt. It’s the accent that fools everyone, y’all. Still, if you haven’t been to Atlanta, Birmingham, Charlotte, Asheville, or Nashville lately, you’ve missed out on a lot of cities shimmering with bold architecture, teeming with inventive companies (didn’t FedEx modernize our way of shipping things? ), bursting with new restaurants and retail stores, while IT and communications firms move here right and left as well. And the people! Ted Turner changed the way we watch news and television. Rosa Parks and Martin Luther King started the Civil Rights movement. I mean, even Dolly Parton changed part of the landscape of TN by building Dollywood and investing in the surrounding area. Now, it’s a major tourist destination. A hick with no vision definitely couldn’t accomplish that. 4. Our accent can be the best way to level the playing field. Letting the world think we’re slow, because we might speak with a slow accent though, can often be used to our advantage. If our drawl fools other regions of the country into thinking they can pull the wool over our eyes, well, they may not be the smartest tack in the box. 3. You can call anyone at anytime of day if you need them, and they’ll be there “in a heartbeat.” One evening my daughter and I were driving back from an all-day trip to “the big city”, still two towns from home, when a deer jumped in front of the car, effectively making the car undriveable. Before my husband could even get to the accident scene, a friend’s teenage son was there to take us – and 7 bags of groceries – to our home. One woman who stopped to “help’ us kept yelling at me that the deer was still alive and I needed to “take care of it.” (I mean, really????) The teenage son called his dad, who was there likety-split with his trusty rifle to put Bambi out of its misery, which in turn, put me out of my misery because the woman finally stopped yelling at me! Someone else loaned us the use of a car until we could get a rental to use while ours was being fixed. Like most of America, it’s in the DNA of Southerners to help when it’s needed; Southerners just usually have a rifle on them when they do. 2. We love the outdoors. Hunting, camping, canoing, hiking, rock-climbing are just some of the things we love to do. But because the weather is (somewhat) warmer through the coldest months, we’ll be outside four-wheeling, gardening, training for marathons, hunting for hogs, or driving to the highest snowy mountain to go sledding if we can. Even if you live in a larger city like Atlanta, Birmingham or Baton Rouge, it roughly takes a half-hour or so to get to the middle of nowhere where you can feel like a true outdoorsman. 1. There’s a church on every corner. No, seriously, there is. One year, my cousin, who lives in upstate New York, came to visit and we took a day trip to a well-known tourist destination a few hours away. Sometimes it’s easiest to drive “as the crow flies,” and other times it’s nice to go the back way and enjoy the scenery. We opted for the scenery, and after a while my cousin commented that it seemed like there was a church at least every mile. After that, we started really paying attention, and honest-to-goodness, there actually was a church just about every mile. But, you know? It’s actually kind of nice that there are so many churches. People that value God and church also value each other. And that’s exactly what I love about living in the South. But I’m always open to suggestions; tell me why you love where you live!